The traditional method, which admittedly works better on a group-project basis, is to try some. If you throw up, get convulsions, or die, it’s poisonous. 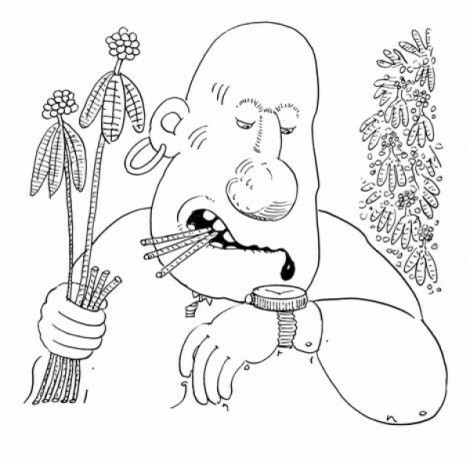 The scientific method, as explained in the U.S. Army Survival Manual, is to memorize the local edible plants prior to getting marooned. Too late for that? The implicit message of the manual is: Soldier, you’re hosed. However, it does offer a plan B, namely the 13-step Universal Edibility Test. This boils down to cautiously trying whatever potential edible you have a lot of and seeing if you throw up, get convulsions, or die. That may not seem like the world’s most helpful advice, but there’s no foolproof way of avoiding poisonous plants. The best you can do is avoid high-risk items while keeping your fingers crossed about everything else. 1. First see if you can find fresh water, meat, or fish. Without water, you’re doomed. Fish or meat, if you can get it, is higher on the food chain than plants and provides a better nutritional mix. 2. Don’t eat mushrooms or fungi. They’re not all lethal, obviously, but when they’re bad, they’re really bad. For example, as we’ve discussed in the past, consumption of Amanita phalloides may result in nausea, vomiting, diarrhea, cramping, kidney and/ or liver failure, coma, and death. The thing is, this mushroom doesn’t say Amanita phalloides on it. It looks like a mushroom. How likely are you to encounter one? I have no idea; you didn’t specify where your deserted island was. If you do know where it is, why are you writing me? Do like the Army says, and memorize those edible plants. 3. Skip anything that smells like almonds—cyanide. 4. Don’t eat anything that’s rotten, mildewed, growing in stagnant water, or otherwise disgusting. You’d think this would go without saying, but all the survival guides make a point of mentioning it, so I figure so should I. 5. Boil it, if you’ve got the means. The army disparages this practice, saying boiling doesn’t destroy all toxins. Maybe not, but it’ll destroy some toxins, and at the same time get rid of the tannins that render foods like acorns unpalatable. Nonetheless, apply the Universal Edibility Test (which we’ll get to below) before chowing down. 6. Watch what animals eat. This is another thing the Army manual thinks is a bad idea, since humans and animals have different vulnerabilities. No doubt, but come on. If an animal eats something and drops dead, I submit that tells you something. More seriously, if an animal eats something without apparent harm, I’d say it warrants further study using the UET. 7. Avoid white or yellow berries, as well as plants with beans, seeds, or milky white sap. Castor bean seeds, for example, contain the deadly toxin ricin; a couple can be fatal. Purple or black berries are worth a try. Red fruit is iffy. Some are fine; many others (yew, holly, woody nightshade) not. Take no chances. UET ’em all. 8. Avoid plants that look like parsley or carrots— could be hemlock. Also, remember: “leaves of three, let them be”—groups of three leaves being the sign of poison ivy, sumac, and oak. Find something abundant. No sense wasting time on a plant that could turn out to be both poisonous and scarce. Pick out one part of the plant to test—for example, just the leaves and not the roots. One may be poisonous while the other isn’t. Which is more likely? No idea. That’s why you’re doing the test. Fast for eight hours, to give anything you ate earlier time to act up. While waiting, hold the plant against your wrist or inside elbow for 15 minutes to see if it irritates your skin. Touch a small amount to your lips for three minutes. Touch it to your tongue for 15 minutes. Chew it but don’t swallow for 15 minutes. Swallow. If you don’t get sick after eight hours, try a quarter cup of the plant and repeat the above. Still breathing? Good sign. Coughing blood? That’s bad. Maybe next time you’ll memorize those edible plants.